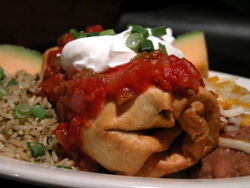 Chimichangas are made with a mix of pork and beef giving the dish a wonderful blend of flavor. Filled flour tortillas fried in oil to a nice crispy brown color. The Brown Mexican Gravy makes this a very special dish. Some people will skip this step, but I believe they are missing a very important part of the dish that makes it complete. Cut both meats into 1 1/2 or 2 inch pieces Heat beef, pork and water to boiling in a 3 quart pot, lower heat cover and simmer until meat is fork tender, about 1 1/2 hours. Drain meat and reserve liquid for making gravy. Shred meat when cooled enough to handle. Heat shortening in large saucepan. Add onion, chilies and garlic, saute 1 minute. Add flour, salt, cumin and shredded meat, cook until mixture is thick but still moist. Add more chilies if you like it hotter. Keep mixture warm. Heat one tortilla on a large griddle or large skillet over low heat until soft and pliable. Spread about 3/4 cup meat mixture over the lower third of the tortilla. About 4 inches long and 1 inch wide. Fold the bottom over the meat and then the two sides in towards the center over the filling. Then roll into a cylinder shape. Repeat until all the tortillas are filled and shaped. Heat 1/2 inch oil in a large skillet until very hot. Saute two chimichangas at a time in hot oil until golden brown, turning with two broad spatulas. Drain on paper toweling, keep warm while cooking the remainder. Place one chimichanga on a serving plate and ladle a spoon of Mexican Brown Gravy over top. Sprinkle with shredded cheese. Then garnish with shredded lettuce and avocado slices and sour cream. Or accompany with it a generous bowl Green Chili Salsa on the side. Put all ingredients in small sauce pan and cook over medium heat, stirring, until thickened. Serve over chimichangas.